William Baize, counselor at Nikki Rowe High School, talks about the many endorsements offered as McAllen ISD eighth-grade students from Fossum Middle School listen. They attended the McAllen ISD Career and Endorsement Fair at the McAllen Convention Center Wednesday, Jan. 24, 2018. The fair will help students better understand their career choices before entering high school. 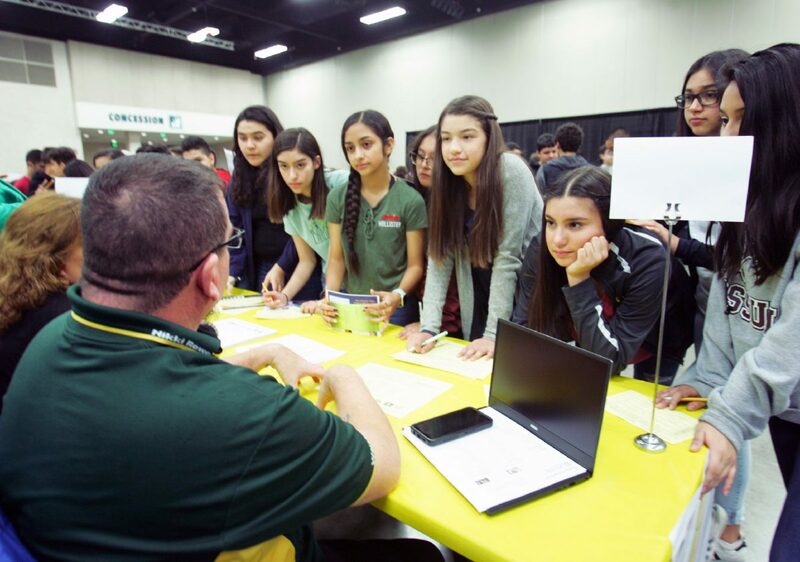 McALLEN — Thousands of eighth-graders were bussed to the convention center Wednesday to learn more about a state requirement that will soon have them choosing a career path as they enter high school. The McAllen school district hosted its inaugural Career and Endorsement Fair aimed at better preparing students to make this important decision. This was mandated by House Bill 5, which became effective in 2013. The bill requires that as students enter ninth grade, they choose one of five paths, which include business and industry, public service, arts and humanities, multi-disciplinary studies, and Science, Technology, Engineering and Mathematics — or STEM — as a graduation requirement. These endorsements are aligned to career and post-secondary education paths, considering that not every student’s plan is to seek a college degree or might need a job right out of high school. The fair is slated to become an annual event and included school advisors, teachers and about 50 community members from different companies that offer jobs tied to these career paths, giving students a better understanding of what to expect. Also on-hand were high school mentors tasked with providing perspective for the eighth-graders. Rob Garza, high school video production teacher for the school district, said his main goal when teaching his courses is to have students understand every aspect of the industry — from learning the technical side of making a video, to building a portfolio and knowing how to present and pitch ideas. At the fair, he provided those in video production with information about how these courses are linked to the business and industry endorsement upon reaching high school. They could then pursue fields such as marketing, public relations and journalism. Mayra Cantu, nurse practitioner at Doctors Hospital at Renaissance, was one of the community members representing the STEM industry. Cantu, 31, is a McAllen school district graduate who obtained her bachelor’s and master’s degree from UT-Pan American — now the University of Texas Rio Grande Valley — and is pursuing a doctorate from UT Houston. Having the opportunity to share her experience and answer questions was priceless, she said, as she hopes these students get a leg up in the game by making well-informed decisions early. Sydney Villarreal, 13, of De Leon Middle School, said she was interested in pursuing a career in the medical field, maybe in orthopedic surgery. But for now she was weighing her options, jumping from section to section and filling in answers in a guide sheet she carried. This prompted her to ask questions about the amount of years of education and travel requirements on the field, among other inquiries. For Reynaldo Silva, 14, of Lincoln Middle School, his curiosity attracted him to a booth set up by the McAllen Police Department, where he asked Sgt. Gaston Balli about the courses he can take now to prepare for the job and what to expect out of the career. While the middle schools are still encouraged to do the traditional career fairs on campus, Ibarra said the idea behind the new fair is to have a district-wide event in which they know every student is getting additional information before they transition to high school.